Congratulations to the University of California, Irvine for winning the Green Cleaning Award (GCA) Honorable Mention (Recycling) for 2015. The green cleaning program at UCI is only four years old, and this is already the second time the university has won the award; in 2013, it won Best New Program. In just a short span of time, this school’s cleaning program has grown from a traditional, outsourced cleaning department to an award-winning, in-house green cleaning program blazing a trail in the realm of recycling and floor care, with ambitious plans for the future. The results were immediate and significant. 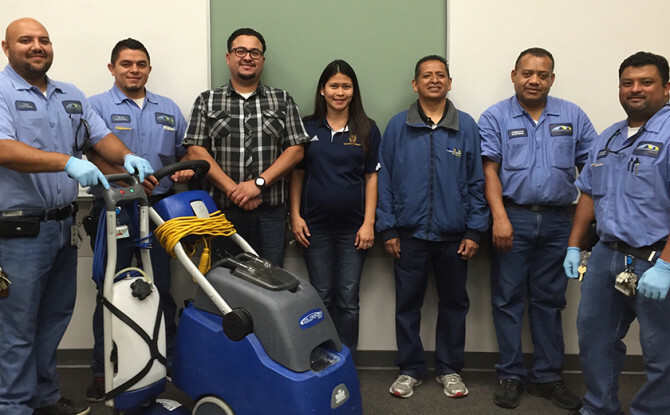 “A few of our floor technicians had been asking for a cartridge type respirator for floor care tasks, which is above and beyond what they should need as part of their required personal protective equipment,” recalls Uresti. “This prompted us to look into the reasons and make a change.” When the program switched to the green products, we found that they were just as comfortable using a standard mask for nuisance level particles. The switch to the green-certified floor care products was a result of concerns over indoor air quality, but it was also a conscious choice to respect the well-being of cleaning staff. The UCI custodians felt valued that those in charge took their health seriously enough to make a change to the system rather than ask them to perform a task that required them to ask for increased respiratory protection. “When you’re communicating with your staff, it’s very important to be able to communicate the overall impact along with the reasons for the change,” says Uresti. More and more campuses like UCI are expanding their recycling programs beyond classrooms and cafeterias into the last uncharted frontier: the restroom. “Many people don’t realize that the waste generated out of our restrooms is mostly comingled recycling content,” says Uresti. When his department noticed that the trash in all of their restrooms was comprised primarily of used paper products, they reconfigured the way they were collecting and disposing of that material as well as how the campus population understood recycling. UCI’s restroom recycling program includes carefully worded signage placed on receptacles to encourage individuals to put food trash elsewhere, which quickly took hold in the campus consciousness. The complete conversion to a restroom recycling program helped contribute to an impressive campuswide diversion rate of 83 percent. Interested in hearing more about the exciting progress UCI’s green cleaning program is making, including the innovative ways it is engaging the student body? Then sign up for our Learn from the Leaders webinar, featuring panelist and presenter Aaron Uresti and a chance for you to participate in the conversation! Is your school interested in being recognized for excellence in green cleaning? Be the first to find out when the award application is released! Network with Aaron Uresti and other GCA winners at the Green Clean Schools Leadership Institute this July. Find out more information and register.